Cast a Pallet 3D is the most comprehensive software in the European market for pallets design and budgets management: an intuitive tool that allows you to reduce the time of negotiation with the customer and optimize the internal exchange of information between sales departments, planning and production. Draw your pallet checking real-time 3D model with listed orthogonal views and technical specifications. Choosing appropriate sizes and materials, you get an accurate estimate of the costs and rationalize the production. With CaP3D you can project quality pallets in full compliance with international laws and standards. ll CaP3D printed documents enhance the image of your company to differentiate it from the competitors. 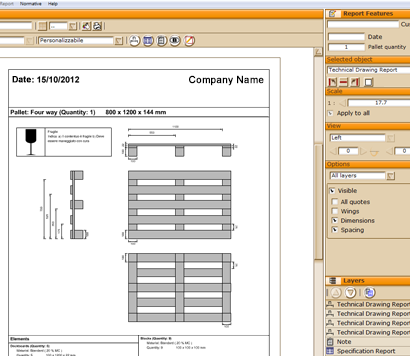 Each element of the pallet is automatically listed in the program for an immediate check of the dimensions. With CaP3D you can print all drawings with details of the customer, the manufacturer and the perspective: you have so a complete record to be delivered to the production department or customer. With Cast a Pallet 3D you can print various documents summary of the project with dimensions, materials, cubages and weight. Thanks to the report you can monitor and control costs, optimizing the production process. With CaP3D you get a documentation for the phase of riveting (number of nails, type, length, diameter and price) and for the marking (types and location of the marks) of the pallet.